In 2000, business leaders in Oregon’s agricultural industry organized the very first Willamette Valley Ag Expo. This event created a place where companies could showcase the newest innovations and celebrate the rich history of agriculture in the region. Since then, this show has grown, now covering over 250,000 square feet with a wide array of products and services on display. To commemorate all the changes within the agricultural industry, the historical society puts together an antique farm equipment display. While some of the featured items have been worked on or painted, the contrast between these pieces and the new equipment shows how much the industry has grown throughout the decades. 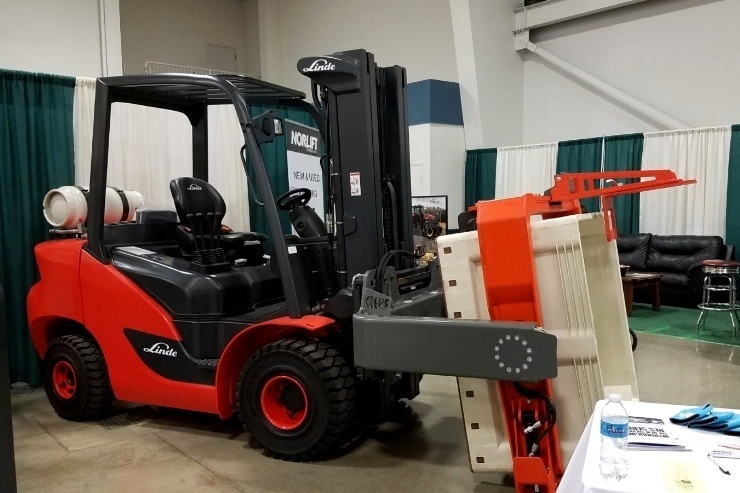 In addition to these traditional agriculture equipment; forklifts, pallet jacks, and other material handling equipment play a large role in the industry. That is why many Northwest berry growers, wineries, juice suppliers, and farms rent and purchase forklifts and attachments from Norlift. This year we chose to feature a Linde forklift equipped with a Clerf bin dumper. This sturdy attachment is built to last with affordable and easy to replace components. With fast bin-stop adjustments, it has been a well received product throughout the produce industry. Call (503) 659-5438 or Visit Norlift Today!